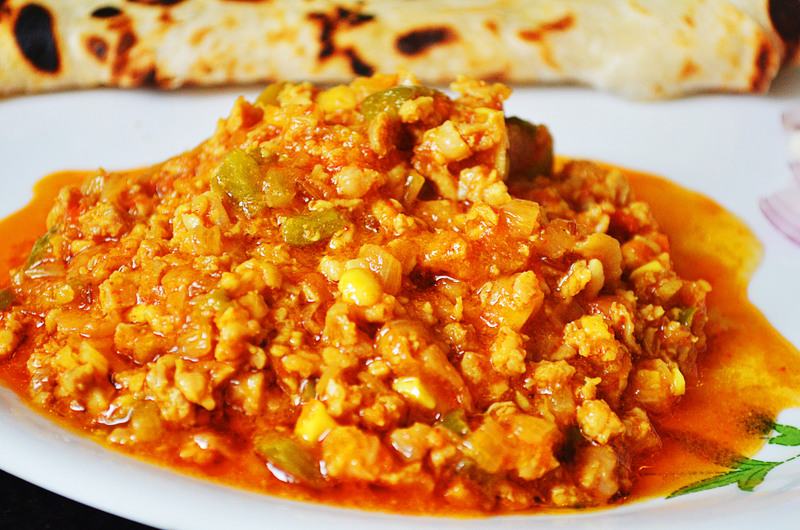 Chicken kheema or chicken mince slow-cooked in aromatic spices is a great comfort food. My husband is a kheema-fanatic which is why I love cooking it for him. The thing I love the most about this recipe is that you don’t need to go shopping for any of the ingredients except for the mince. All the others are already there sitting on your kitchen shelf. This recipe with all its stellar ingredients is undeniably a supper perfect for the Gods. 1. In a pan add oil, bay leaf, green cardamom, cumin seeds and cloves. Fry till they release the aroma. 2. Now add chopped onions. Saute till golden brown. Remove the bay leaf. 3. Add garlic, ginger, butter and saute. 4. Add green chillies and capsicum. Saute till the capsicum is soft. (For about 3-4 minutes). De glaze with some water. 5. Now add all the powders – turmeric powder, red chilli powder, cumin powder, corriander powder, asafoetida and salt. Saute. 6. Add the mince. Saute for 3-4 minutes. Add milk and mix well. 7. Add the tomato puree, sugar and lemon juice. Cook for 10 minutes on medium flame. 8. Add 1 cup water. Cover and cook till the water evaporates and the mince is cooked. 9. Garnish with chopped coriander leaves, chopped chilli and a dollop of butter. 10. Serve hot with paratha/roti/naan/paav accompanied with sliced onion and a lime wedge. P.S. : This recipe is great even with mutton mince.